Thanks for choosing to hire our facilities. We take information security very seriously and your card details will be processed on a secure encrypted (SSL) page. In addition, we are also registered with the Data Protection Act - your details will never be passed to a third party. You should have received a pro forma invoice from us. Get this ready for the next step, since it's a good idea to enter this number, so we can easily identify your payment. 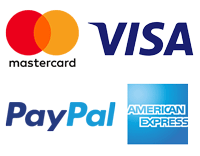 We are responsible for your online payment and accept Visa and Mastercard debit and credit cards through our payment partner SagePay, plus PayPal too. Once you have entered your personal details in the first step you will then be taken there in Step 2 to complete the transaction.